WARSAW, Poland (CNS) — Bishops in the Central African Republic urged Catholics to boycott their country’s National Day observance Dec. 1 to protest the failure of government and United Nations forces to prevent the massacre of church members by rebel groups. The bishops’ call in late November came after two priests and at least 60 civilians were killed Nov. 15 in an attack on displaced people who had camped near the Catholic cathedral in the southern town of Alindao. In a statement released after the bishops met in the capital of Bangui, the prelates said the church would help “restore the truth about the unacceptable, odious crimes” committed in Alindao. The bishops also designated Dec. 2 as “day of sorrow and prayer” in all Catholic dioceses. Church sources said Msgr. 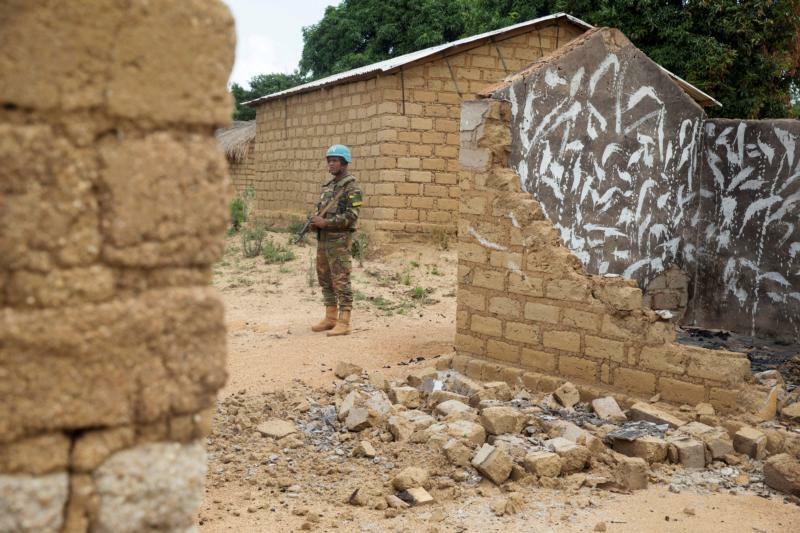 Blaise Mada, vicar general of the Alindao Diocese, and Father Celestin Ngoumbango, a parish pastor, were among those killed when an offshoot of the Muslim-dominated Seleka rebel militia attacked the cathedral camp, where 26,000 people have taken refuge. Bishop Nestor-Desire Nongo-Aziagbia of Bossangoa, vice president of the country’s bishops’ conference, accused foreign troops with the U.N.’s Multidimensional Integrated Stabilization Mission of showing “passivity and complicity” toward the violence. He said during a news conference Nov. 26 that witnesses reported Mauretanian troops who are part of the mission laughed while the atrocities were committed. Cardinal Dieudonne Nzapalainga of Bangui visited the massacre site Nov. 24 and later said he believed “competent security authorities” had been negligent. “We have the impression these populations have been abandoned — this is what they’ve told us loudly and clearly,” he told Vatican Radio Nov. 26. The mid-November attack was the latest in a series of similar acts of violence against Catholic communities as Central African Republic leaders confront a simmering fundamentalist Islamic insurgency.